Ligers are the world’s biggest cats, larger than their parents, with the strength of a lion and speed of a tiger combined. An average male liger stands almost 12ft tall on its hind legs and weighs up to half a ton, twice the weight of a wild lion or tiger. How did the liger appear? 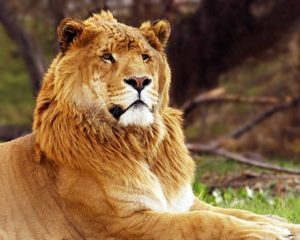 If the father is a lion and the mother a tiger, the offspring are known as ligers and the pairing results in gigantism. Strangely, if the pairing is reversed and the mother is a lion, the offspring – known as a tigon – will be small, weighing less than 150 kg. Ligers (picture left) and tigons (picture right) are not thought to appear in the wild, as the behavior and habitats of lions and tigers make interbreeding unlikely. In the Thirties in South Africa, the two species were put in the same cage and, to the keepers surprise, they didn’t fight. In fact, they made love, and the liger was born. So popular did they become that zoos in Europe clamored for specimens and so stray dogs on that Continent also came to be frightened away by massive mounds of manure. Ligers look like both their parents only bigger. Their teeth are whoppers: two inches long. They may resemble either parent, and range from white to gold to brown, with or without spots and stripes. 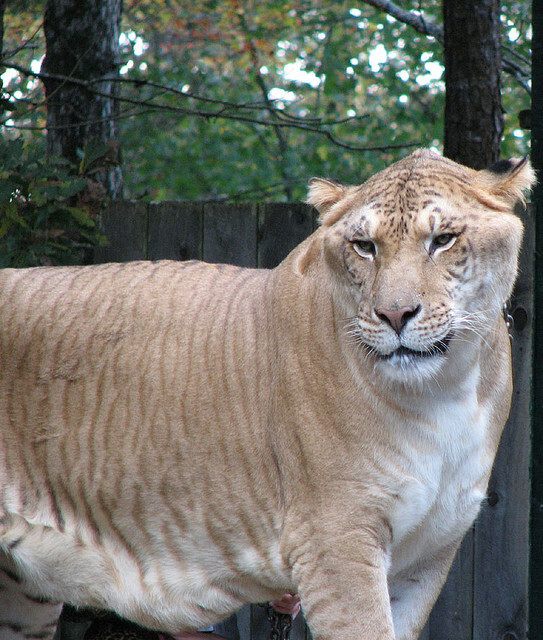 A male liger may have a mane, but it is usually much smaller than his father’s. As hybrids, ligers have low fertility rates, but some females have produced an offspring by mating with full lions or tigers. Liger males are totally unfertile though. 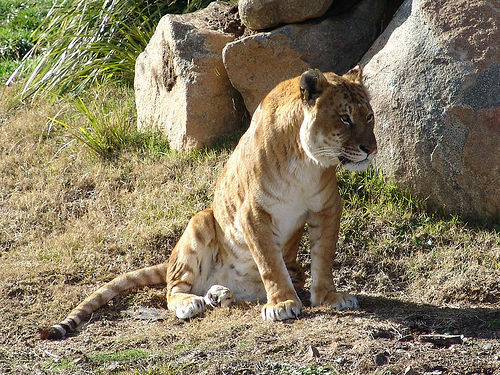 On a typical day, a liger will devour 9kg of meat, usually beef or chicken, and is capable of eating 45kg at a single sitting. When he is fully grown he is expected to reach 3.5m, and more than 300kg. 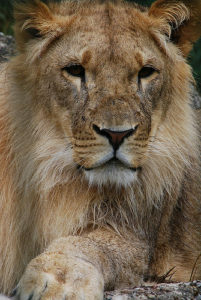 Ligers (image 1) are the offspring of a male lion and female tiger. Tigons (image 2) are the offspring of a male tiger and female lion. While you would think they are similar, in fact the two animals are very different. While ligers are the mightiest of cats, tigons are in fact smaller than a lion or a tiger. Tigons are even harder to breed than ligers and there are less tigons in the world. Although tigons are more inclined to dwarfism, it is not always the case. However, they weigh on average almost 3 times less than a liger.